NAUGATUCK — There is really nothing in the heat of competition that can quite match the intensity of a sibling rivalry. From a game of hoops out in the driveway to a simple board game at the kitchen table, tempers can flare and the trash talk can fly when family members compete. 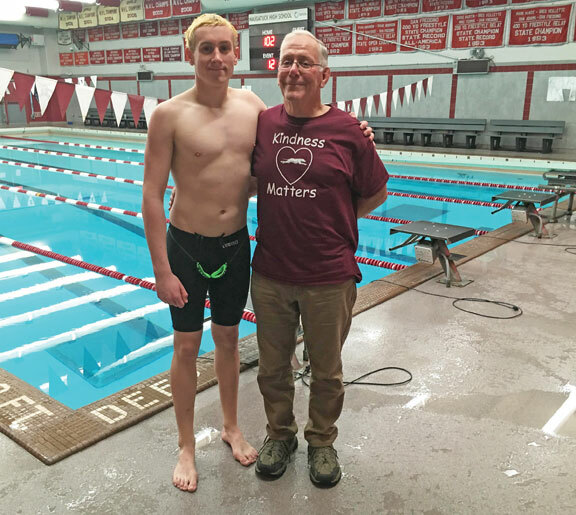 This year’s Naugatuck boys swim team has that fuel to ignite the passion of competition. Senior captain Brian Goggin is the last in a line of Goggins that stretches back to 2007 to swim for the Greyhounds. “My oldest brother, Jimmy, graduated in 2010 and was a member of four straight NVL championships,” Goggin said. “My sister Rachel graduated in 2013 and was a team captain. I did get to swim with my middle brother Matt, he graduated in 2017. Naugy sophomore Bailey Ceryak has been trying to best his dad, Brian, ever since he was a little boy. There are signs that the younger Ceryak is quickly catching up to the legacy that he’s held in his mind since he was a youngster. At this year’s alumni meet, Bailey got to do what he’s always wanted to do, and that is to beat his dad in the pool. Brian is so proud to see the progress that his son has made and was even gracious in defeat. Naugatuck junior Austin Herb is in awe of following in the footsteps of a legacy that he couldn’t even imagine, his grandfather Carl. Carl swam for Naugy and graduated in 1964 as an All-American, All-State and All-New England swimmer. He was a member of the 200 medley relay team that set a State Open record. His son Chris was too busy playing football and track while serving as class president for four years to take up swimming. But Grandpa Herb had the opportunity to share his love of the pool with his grandson Austin and taught him how to swim at the YMCA. “You get so busy working and raising a family you don’t get the opportunity to see all the events your kids are involved in,” Carl said. “But as a grandfather, you get that second chance, especially babysitting and having your grandson around all the time. Austin has worked hard to get where he’s at right now — the Greyhounds’ long distance threat in the 500, a grueling race that demands discipline and endurance. Naugatuck head coach Jim McKee has patrolled the pool deck for 42 years guiding the boys team and 32 years leading the girls team. Along the way, the three-time Connecticut Swim Coach of the Year has compiled 628 wins, 24 NVL titles and a state championship in 1992. McKee guided the girls to four straight NVL titles from 2002 to 2005. That was followed by the boys’ four-year run of league titles from 2007 to 2010. Naugy improved to 7-3 with a 104-77 win over Seymour on Tuesday. The victory followed wins over Torrington, 88-74, and Sacred Heart, 102-79, last week. Naugatuck will host Wilby on Friday. The Greyhounds close out the regular season next Tuesday at Woodland before they gear up for the NVL championship meet on March 2.